Well come to find out, it's quite the task trying to capture a video of our little Landon walking! He loves grabbing the camera which does not make for a clear video. Here he is walking at pumpkin patch #2 (we went to another one on Sunday to find a "daddy pumpkin"). He loves his new freedom and truly enjoys watching mommy chase him everywhere! My face lights up every time I see this video! OK, so those of you that know Kennedy this picture may not come as a surprise! I asked her to get ready to go and this is what she came up with - I LOVE IT! What can I say, she has a very eclectic taste! This past Wednesday, Jared left for Key West for additional flight training. He'll be back on Monday (fingers crossed) and life will be "normal" again but only for a short time. As I'm writing this, I feel such a sense of sadness - my emotions are really getting the best of me tonight. I probably could go on and on but it's probably better I don't take you down my emotional roller coaster. When my little Kennedy asks, I sometimes ask myself why God has put us here. I guess that question is not for me to figure out right now. I do know one thing for sure. The feeling I have when Jared gets back from these deployments and detachments is an emotion I can't put into words! My appreciation for what he brings to our family is immeasurable. He is my love and my best friend - life just isn't the same without him. With ALL that being said, Kennedy, Landon, and I made it over to the pumpkin patch today. It was Jared's absence that stirred up all these feelings today. As I stood strong in front of the kids, I couldn't help but feel alone on a Saturday that all I wanted was my hubby. Despite my feelings today, I truly enjoyed watching Kennedy and Landon in their element. They love the freedom of running and being carefree - it's their joy that gets me through these bumpy days! She thought this was the coolest pumpkin ever, "Take a picture mommy...take a picture!" Kennedy found the beauty in this "not so perfect" pumpkin! Landon enjoyed finding his way through the pumpkins and keeping mommy on her toes! Just in case you don't know this WELL KNOWN fact, Jared loves Chipotle! According to a recent survey taken by Jared S. Raftery, he has visited over 50 Chipotle's in 12 states! Well if this isn't proof enough, today is where this friendly relationship between man and burrito has turned into a pure obsession (kinda kidding but not really). OK...so here's the story. 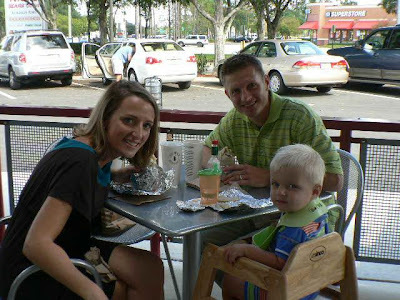 A few months back, we learned that Chipotle was coming into Jax. Jared was beyond excited. He had been waiting 5 long years for a Chipotle to be located within a 60 mile radius of us. Trips to Houston, San Antonio, Orlando, and Gainsville have always been on our monthly agenda (in case you don't know, Houston is 4 hours from Corpus Christi!!!). Jared has been sporadically checking on the construction progress of our Jacksonville Chipolte and making sure things where right on track. About a week ago, I was on a local website for kids and I saw an advertisement for Chipotle's pre-opening party with free burritos. When Jared learned of this so called "day in history", he started planning out our whole day. Here's how it went.....wake up, drive Kennedy to playschool at 8:30, drop her off, drive to Chipotle, wait in line for 2 hours, have Sam and Landon join me at 11:00. Scary right?? There we were, 5 minutes away from having our first Jax Chipotle burrito chatting with the other Chipotlians. Jared was in his glory and I loved every minute of it! Pumpkin time is here and we (our maybe I should say I) have been really looking forward to visiting Conner's Amazing Acres. This family farm is filled with fall festivities galore. From hayrides to pie eating contests, this place has it all. Our 45 minute drive north took us to a place that felt far from Jax - which was actually a welcomed change. Kennedy was pumped because this was the day we were going to "pumpkin time" as she calls it. Landon was along for the ride and Jared was happy just to make us girls happy - love you sweetie! We had a great day enjoying the fresh air and hanging with the fam! Hanging in the hay - Boys are a diffrent breed but I love it! On our hayride, Kennedy had a chance to feed the cows. She thought it was so amusing when the cows "got her" (meaning they licked her)! We went on a "moo-moo" train ride - bumps included! As many of you know by now, we like to plan our family getaways at the last minute. It's actually quite amusing how the Navy has transformed us into a breed of drop everything and GO GO GO! Jared is on his pre-deployment leave so we decided a quick trip up to Savannah was in order. Considering Savannah is only a couple hours away, we wanted to take advantage of this time as a family before our daddy-o heads off for 6 months. We had an amazing time and the scenery was truly beautiful! A passer-by took a quick snapshot of us - these family photos seem to be rare these days! Kennedy on our trolley ride - she called it her "trolley train"